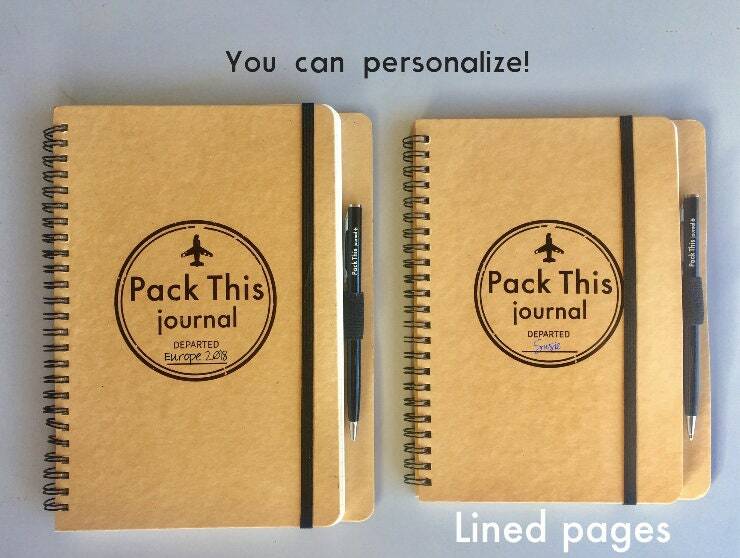 Pack This Journal - Personalized Travel Journal with pockets, Spiral Notebook, LINED paper, includes pen & Glue Dots. FREE SHIPPING! We do Not personalize the cover. That is meant for the recipient to do. Please let us know if you would like to include a vintage postcard to you or recipient, and what you would like the postcard to say. Thank you! THE PACK THIS JOURNAL. A hardcover, spiral travel journal. In one journal, you can keep your words and your things. You can pack it full of whatever you want, and the memories that are attached to specific items. Use the pen to write your words, and the included glue dots to add your items to the journal. The pages offer space to write, doodle, glue, and track every moment of your trip. The lines are there to keep your organized, but disregard them if you need. This is your journal, do with it what you want. I encourage you to collect everything you see: the card from your favorite restaurant, the receipt from the bus you took outside the city, the plane ticket that took you exactly where you needed to go. Everything has a memory attached to it, so use it. LARGE, 6 X 9 inches (15.24cm x 22.86cm). SOLD OUT Small journals are made with 100 pages (95 lined sheets) bright white acid free lined paper (this paper has a nice thick feel to it, does not bleed through, handles well) 2 sheets of glue dots included. 24 total dots. Large journals are made with 200 pages (195 sheets) bright white acid free lined paper. 3 sheets of glue dots included. 36 total dots. Both journals have the instructions, quote, and map in the back to track your adventures. Bound with black twin loop wire. Your journal will lay flat. This part is up to you! The line on the front of the journal can say your name, or your destination! whatever you prefer. The first page also shows who it belongs to. You can add in whatever you want! All our notebooks will be carefully packed with love as quickly possible. Normally within 1-3 business days. Go to PackThisJournal.com for more information and to see customer images and testimonials! PLEASE NOTE: While I do my best to make sure your package reaches you safely, I can't be held accountable for loss or damage once the package leaves my hands. Please make sure that your Etsy address is the address you'd like me to ship to. If the customer provides the incorrect address and the order is returned to me, a replacement card can be sent at the customer's expense. I am working on doing custom orders as we speak! As of right now, we do not do them. Do you have something you would like to see in the ALBA shop or with the pack this journal? Please let me know! The journal can be personalized by YOU! Wholesaling is available and encouraged! I would love to work with you in your local shop.